Sword and sorcery movies seem to fail more often than succeed. Aside from the original Conan the Barbarian and a possible inclusion of The Lord of the Rings trilogy into the subgenre, there is just something missing that does not carry over from print to the silver screen. In 2011’s version of Conan the Barbarian, narration done by Morgan Freeman introduces us to the Hyborean Age in the world of Cimmeria. Sorcerers have created an all powerful weapon in the form of a mask that gives immense, world ruling power to anyone who puts it on. Luckily, Chief Corin (Ron Perlman) of the Cimmerian tribe is able to defeat the sorcerers and destroy the diabolical mask into pieces that are now scattered across the land. A few years later, our titular hero is born on the battlefield, which is a sign on greatness. His talent is seen early on, slaying members of a rival tribe at an adolescent age. Not long after, the village of Cimmeria is attacked by Khalar Zym (Stephen Lang), who is systematically looking to rebuild the mask, piece by piece in hopes of harnessing its power. In the process of obtaining the piece scattered in Cimmeria, the entire clan and village is slaughtered and set ablaze, including Conan’s father. 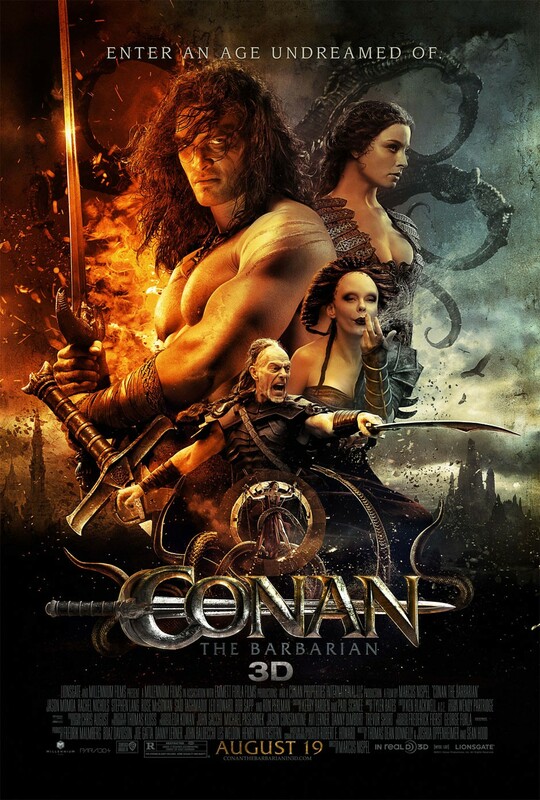 20 years later, Conan (Jason Momoa) is driven to exact revenge on this man, unaware to the fact that this is much more than a vendetta that soon will become a race to save Hyboria. I paid $2.99 for this movie, and after 10 minutes, I immediately thought how that $2.99 could have been better spent. In other words, I am saying this movie is one of the worst I have ever seen. And really, it is mind blowing and simultaneously mind numbing that roughly 90 million dollars was spent on this abomination. The fact that this was in development hell for so long should have tipped someone off in the studio that this was not a smart move. Where to start? Well, remember that narration I mentioned right at the beginning? Mr. Freeman has such a soothing voice that gives credence in a multitude of works…except this film. Here, it comes off as so laughable and disjointed compared to what is on the screen. When his voice is heard, I was expecting something important, not some half-hearted battle sequence. Big waste on whatever that was paid to him. Not long after, there is a scene where Conan is born Caesarian-style during a battle. Upon birth, his father Corin raises him in a way reminiscent to Simba in The Lion King. I kid you not. Plot wise, Conan the Barbarian features one of the most incomprehensible ones I have ever known, and is where a lot of the film’s problem lie. After the prologue, scenes do not lead into one another. There is never any explanation as to why our characters are in a cave, and then a forest, and then a ship. It just happens, early and often. So why should I care if the writers don’t? To no surprise, the film was written by three writers, and I am fairly positive that all had differing ideas regarding the script. Having multiple writers is not always a bad thing, as in some cases having multiple writers can serve as a “checks and balances” system of sorts. But on the flip side, having multiple writers (especially three or more) often renders a plot/script to a pile of mush. Still, the efforts of a cast can raise bad material to at least passable from time to time. Unfortunately, that is not the case here. Jason Momoa as Conan may be the best (read: least offensive) thing about the movie. He has his share of deplorable moments, but by and large, he tries to bring some excitement to the role. But if I am being honest here, I did not buy him as a barbarian. Without a doubt, he trained a great deal to get in shape for this movie, but he looked small. It could just be that Arnold Schwarzenegger has forever tainted my view on what a barbarian is supposed to look like, and for better or worse now every time I hear or see the word “barbarian” I think hulking brute. As for everyone else, I am less than forgiving. Rachel Nichols serves as his love interest and the chemistry is non-existent. An emotionless and doe-eyed performance. Ron Perlman is highly forgettable in a paycheck performance. Rose McGowan plays this evil sorceress who isn’t in the least frightening, aside from the makeup. However, she is more interesting than the main villain portrayed by Stephen Lang. Khalar Zym is very underwritten as the bad guy who just exists because he is bad, but more screen presence could have been brought by Lang. You can tell that he was not interested in this role in the least. At the very least, you would hope to see some intense sword fight scenes right? Once again, the movie fails. Nothing feels inspired or looks cool, and the fight scenes in the 1982 version are infinitely better than the ones here. Much blame has to be placed on editing. I wanted to feel every blade blow and punch thrown, but the camera obscures or removes the action 95% of the time. Additionally, there is no sense of setting either. The movie looks like it could taken place anywhere, and generally, it just looks downright terrible. Worse yet, the green screen and CGI can be spotted a mile away, specifically in horseback scenes but really anywhere. No effort was made whatsoever to least make it look competent. The only reason this does not get an F- is Momoa, because he actually tries. Aside from him, there is nothing of value with Conan the Barbarian. The only thing barbaric is the quality of this film. Good review Jackson. Such a strange movie. However, it is over-the-top and never tries to be at all serious, so for that, I had to give it the benefit of the doubt. You know, given what it is. Of course. For me, the plot and editing did it no favors, but if people can look past that, there is no reason to just throw it on one day in the background I suppose. I expected a bit more polish from a 90 million budget though. I love this film. It has Ron Perlman and should have been Oscar nominated. What are you talking about Movie Man? Kidding, I avoided it. Looks like it was with good reason if it isn’t even worth $2.99. I do like Perlman but he is quite minor anyways. Screw this!! A wise choice. Sometimes the viewing of awful movies does give you a greater appreciation for those good and great movies though! I avoided this one, because I expected it to be terrible. Seems that expectation was good and proper. I will continue avoiding it. Good review! Great decision. I could see some people having it on in the background, but in my opinion it isn’t even good for that. Just an all-around terrible film. I own it, but have yet to watch. Loved the comic, the books and the first Arnold movie. The Arnold one is so much fun. This? I may have been a bit cruel but man was it so much wrong.